Looking for Govt Jobs in India? 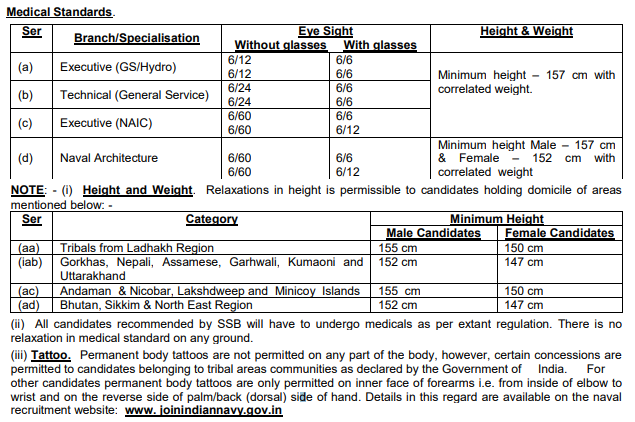 Indian Navy has advertised for recruitment of 118 Naval Armament Inspectorate Cadre Post vacancies. Interested and eligible job aspirants are requested to apply online on or before 24th August 2018. Check out further more details below. * 37 vacancies for General Services and three vacancies for Hydro cadre. course in any of the under mentioned disciplines from a recognised educational institute with 60% marks till 5th/7th semester in regular/integrated course respectively. Age Limit: Born between 02 Jul 1994 & 01 Jan 2000 (both dates inclusive). How to Apply: Interested and eligible candidates are requested to register and fill application on recruitment website www.joinindiannavy.gov.in. The candidates are to apply from 04th to 24th August 2018.
for shortlisted candidates will be scheduled at Bangalore/Bhopal/Coimbatore/Visakhapatnam/ Kolkata during Nov 18 – Mar 19. Shortlisted candidates will be informed about their selection for SSB interview on their e-mail or through SMS (provided by candidates in their application form). (b) A choice of date for appearing in SSB will be indicated in the application dashboard on www.joinindiannavy.gov.in for shortlisted candidates. Candidate is to choose suitable date and submit the same. (c) SSB interview will be conducted in two Stages. Stage I test consisting of Intelligence Test, Picture Perception and Discussion test will be conducted on the first day of arrival at SSB. Candidates who fail to qualify in Stage I will be routed back on the same day. Stage II tests comprising of Psychological testing, Group testing and Interview will last for 04 days. Successful candidates will thereafter undergo Medical Examination (approx duration 03-05 days). (d) Candidates recommended by the SSB and declared medically fit will be appointed for training as per all India merit of SSB marks depending on the number of vacancies. (e) Change of SSB Centre for interview is not permissible under any circumstance. (f) Any correspondence regarding change of SSB dates be addressed to the call up officer of the SSB on receipt of call up letter. Candidates are to download the call up letter on receiving intimation from IHQ MoD (N) at SMS/email (provided by candidate in their application). (g) No compensation will be paid in respect of any injury sustained as a result of tests during SSB interviews. (h) AC 3 tier rail fare is admissible for the SSB interview, if appearing for the first time for that type of commission. Candidates will carry photocopy of the first page of pass book or cheque leaf where the name, A/C No. & IFSC details are mentioned, while appearing for SSB. (a) Correct filling up of personal particulars. Details are to be filled up as given in the Matriculation Certificate. (b) Fields such as e-mail address, mobile number are mandatory fields and need to be filled. (c) All relevant documents (preferably in original), marks sheets upto 5th & 7th semester for regular and integrated courses respectively, date of birth proof (as per 10th & 12th certificate), CGPA conversion formula for BE/B.Tech and a recent passport size colour photograph should be scanned in original JPG/FITT format, for attaching the same while filling up the application.